You'll Never Run Out Again! If you are looking for more homemade dog treat recipes, a thoughtful gift for a new dog owner, or new ideas for making homemade dog food recipes, this book Discover the Secrets to Making Healthy Dog Treats, is what you've been looking for. The main book, not including the extra cookbooks, has over 125 pages full of homemade dog treat recipes. 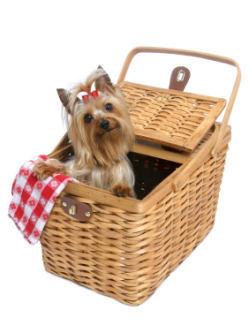 There is a nice mix of dog treats, full meals, and extras to keep you busy baking and cooking for months on end. After purchasing around 15 different dog recipe books for treats and meals, I can honestly say that this is one of my favorites. There are even a few pictures of the end product, something I have yet to see in another recipe eBook. 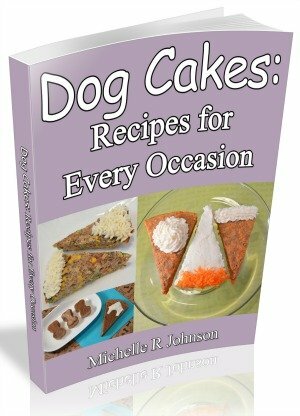 There's even dog treat icing recipes, recipes for gravies and sauces, and several dog cake recipes for every special celebration. If you've never baked for your dog, this is book has many easy dog treat recipes to choose from to get your feet wet and give your dog tasty treats. These homemade dog treat recipes use common ingredients you may already have in your pantry, so you can get started baking without planning a trip to the grocery store. This book, surprisingly, has few typos. But, a major typo or error is the inclusion of certain unsafe dog food ingredients. However, you are most likely a savvy dog owner and have read my list of foods poisonous to dogs, so you will know how to alter any dog treat recipe if needed. Just look out for any hidden unsafe ingredients, for example, a couple of the recipes call for condensed soups. While these provide a time saving solution, they are also high in salt, and may contain onions. Are you ready to start making your dog's main meals and you're not sure where to start? This is the place. It is not just a cookbook for dog treats. There are many meals to choose from. The meals are an alternative to only giving your dog dry kibble. Besides, variety in your dog's diet is one key to a healthy lifestyle. This book, Discover the Secrets to Making Healthy Dog Treats has so many new dog treat recipes that you may not have seen on other websites, and interesting ingredient combination's to keep your creativity flowing in the kitchen. You'll never run out of homemade dog treats again. You'll be tempted to not only fill your freezer, but your neighbors freezer full of delicious dog treats and meals, just so you can make every dog treat recipe in this book!